Car battery maintenance is a year round requirement, because it is very frustrating to find in a morning that your car suddenly can't start because of the dead car battery. It happens usually in the coldest days. 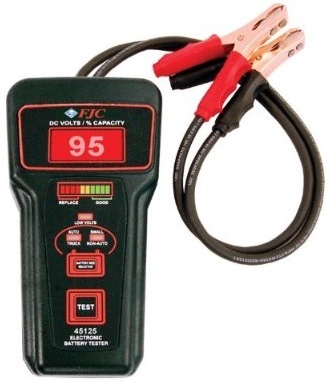 Testing a battery is fairly simple with a selected car battery tester. Read on how to test a car battery! IMPORTANT SAFETY NOTE: Keep any open flames away from the automotive battery as it produces hydrogen gas that is extremely flammable. Automobile batteries are full of sulfuric acid that can burn your hands. Short-circuiting car battery terminals produces electric arc hot enough to melt steel. The first car battery test is measuring open circuit car battery voltage to determine state of charge of your lead acid battery - how fully it is currently charged. Open circuit voltage is measured 12 hours after stopping your car (to allow surface charge to dissipate and enable a more accurate reading) with the engine not running. You can use a dedicated automotive battery tester or a multimeter/voltmeter (see multimeters selection on Auto Parts Warehouse and Amazon). With the dedicated auto battery tester you connect terminals to the car battery, press the test button and see the measured car battery voltage. With the multimeter you configure it to measure direct voltage up to 20V, connect the red lead to positive battery terminal, black lead to negative and read the measurement from the screen. It is not necessary to disconnect the battery from the car first. Car battery voltages above are for measurements with battery temperature 70°F (21°C). When the temperature is lower, voltages will also be slightly lower. For example, at 30°F (-1°C) for a maintenance free car battery 50% charge is at 12.24V. These numbers are for measurements with battery temperature 70°F (21°C). When the temperature is lower, specific gravity will be slightly higher. For example, at 30°F (-1°C) 50% charge is at 1.210. Some sealed maintenance free car batteries have a small built-in hydrometer called Magic Eye with colored readings indicating a good condition (green), a condition when charge is needed and when it is time to replace the battery. 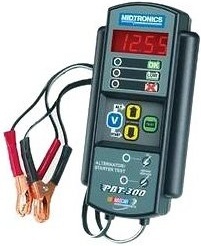 Performance load testing is used to measure battery's ability to produce current. Capacity load testing is for determining the reserve capacity or amp hour capacity of a battery. (Note, that state of charge alone doesn't say anything about the battery storage capacity.) The primarily purpose of a car battery is to start an engine, so the battery's performance (or ability to produce high current) is an important test. In the load test you measure car battery voltage under load similar to what happens when starting the car. Before performing this test make sure that the state of charge of your battery is greater than 75%. In the test apply a load equal to one half of the cold cranking amperes (CCA) rating of the battery for 15 seconds. During the load test, the voltage reading from car battery terminals should not go lower than 9.6V for ambient temperature 70°F (21°C). At 30°F (-1°C) the voltage can go no lower than 9.1V. 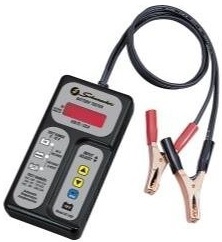 The dedicated car battery load tester device consists of a large resistor that has a resistance similar to a car's starter motor and a meter to read the battery's output voltage (see load testers selection on Auto Parts Warehouse and Amazon). When load is applied, it draws approximately the same current the car's starter motor would draw during cranking. 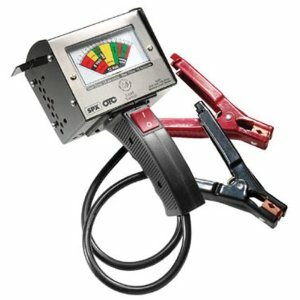 If you are good with cars, you can perform a load test without a battery load tester. Temporarily disable the ignition in your car (for example, by removing the fuel pump fuse) and turn the engine over with the starter motor for 15 seconds. After the load test, recharge the battery as soon as possible. Alternative more technologically advanced devices to measure battery capacity are electro-chemical impedance spectroscopy (EIS) testers and conductance testers. With the selected car battery tester(s) you may like to regularly keep an eye on your battery. At the very least test the battery once a year every autumn on first cold days.